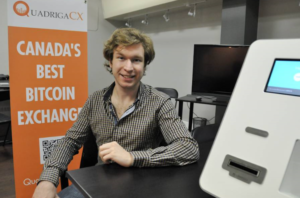 Canada’s largest cryptocurrency firm Quadriga CX is facing a peculiar problem. The company’s founder and CEO Gerald Cotten has died taking key passwords with him. As a result, Quadriga is not able to pay its customers $200million. All the passwords of Quadriga’s digital wallets — an application that stores the keys to send and receive cryptocurrencies — were with Cotten who died in India from complications of Crohn’s disease. He was 30. The laptop, email address and messaging system of Cotten are all encrypted and the same has been mentioned in an affidavit filed by his widow Jennifer Robertson. It was only Cotten who used to handle all the funds and coins and the banking and accounting side of the business and, to avoid being hacked, moved the ‘majority’ of digital coins into cold storage. Experts have already been called to hack into Cotten’s other computers and mobile phones but met with only ‘limited success’. They have not been able to access an encrypted USB key. Quadriga CX’s directors posted a notice on the firm’s website on Jan. 31 that it was asking the Nova Scotia court for creditor protection while they address “significant financial issues’ affecting their ability to serve customers. Meanwhile, speculation on online forums is growing by the day while some calling the entire business a scam, and some others even wondering if the CEO is indeed dead.